I immediately felt confused, and like an outsider, not because of anyone’s actions, but because I was confused about where to park. It almost seemed that there were two restaurants that shared one parking lot, a narrow and long set of numbered spots with yellow tin roofs, which I appreciated, seeing that it was 89 degrees outside and I drive a black car. I chose one and took a moment to take things in. I had to sit and wait for my mother (who I roped into this, thanks Mama!) to arrive at the restaurant, so I did some people watching. There were lots of cars all around me, which was a shame, since we intentionally decided to come at 2 in the afternoon, hoping that we would miss the lunch rush and have the restaurant mostly to ourselves. Instead, I was surrounded by white people of all shades and socioeconomic statuses—businessmen and AC repairmen both walked out of the restaurant with red and white to go cups (12 new milkshake flavors, a nearby sign professed) and white plastic baggies weighed down with leftovers. A mother balanced a chocolate dipped ice cream cone as she dragged her four year old to the car. I felt conspicuous with my out of state tags and nervous expression. Soon my mama arrived, and I finally got out of the car. Behind us was the national headquarters and administrative office, which professed opportunities for employment and shipped barbeque, but we walked the other way, toward a building lined with palmetto trees and a drive thru that wrapped around the side. The front door was framed by two flags, one American and one South Carolinian, which hung lazily at the base of its pole, practically lost in the bushes. I couldn’t help but wonder what had once hung there, but like I said, I was trying to give Maurice a fair chance, and I hadn’t even walked in the door yet. Inside was air conditioned and well-lit, with wood-paneled walls and an open kitchen that could be seen from every dining room. The walls were lined with bottles of barbeque sauce, articles about local sports and the restaurant’s fame, and t-shirts that claimed to “Heart BBQ” with an outline of South Carolina replacing the heart. The menu was large and overwhelming, and we had the woman standing behind the front counter, a small white girl with an auburn ponytail, explain to us the difference between The Big Joe sandwich and the Little Pig plate. The staff was very friendly, and our waitress didn’t seemed shocked to see us, though I watched her face carefully for signs of disdain or confusion. Instead, she cheerfully explained that if we got the meat’n three, it’d be cheaper than the rib dinner. 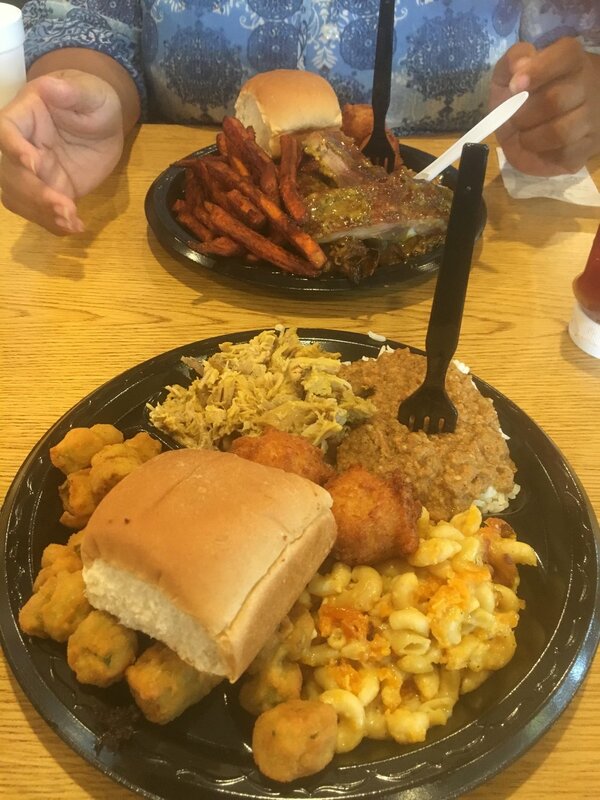 I ordered their traditional chopped barbeque, with hash and rice, macaroni, and fried okra, while my mother got their barbeque ribs, with hash and rice, macaroni, and sweet potato fries. I wanted us to switch it up a little more, but to be honest, both of us didn’t feel like sharing too too much, just in case something was really good. We were seated, and I looked around the restaurant while I waited for the food to come. This is when I finally saw him, of course. Maurice, painted grinned and friendly in a frame on the wall, surrounded by his products. His legacy, I suppose. A light shone on his face, and I couldn’t help but stare at him. It was clearly a place of honor, and I suppose, why shouldn’t it be. This was his Graceland, his Monticello, and I couldn’t tell if I was discomforted by my presence in front of his shrine, or if I felt like it was an act of resistance. I guess a little bit of both, since I paid $11.92 to be there. The rest of the restaurant was decorated in red white and blue decorations that were clearly American themed, and decidedly not-Confederate. It was almost as if a legal team had join through the restaurant with a fine-toothed comb, removing everything that could be considered politically incorrect. ESPN played where I was certain Fox News would be showing. It was almost suspiciously patriotic and normal, as if compensating for its past Confederate history, but soon our waitress, Jayne, brought us our plates, and I wasn’t thinking about much else but the sweet smell of mustard sauce and pork. This was the moment that I’ve been waiting for, so I went for the thing that was most likely to bring me back if it was good first, the hash and rice. I’ve talked about my devotion to this particularly unphotogenic Carolina specialty, but unfortunately, Maurice’s version did not blow me away. It was made in the traditional style, with ambiguous ground meats served over a bed of white rice, but lacked the vinegary or mustardy punch that good hash and rice requires. It was passable, but not good enough to tempt me to come back. My mother agreed, though she seemed to enjoy it a bit more than me. The fried okra was really good, though I never met fried okra I didn’t like, and my mama’s sweet potato fries were really nice, cinnamony and sweet and surprisingly impressive to me. Both meals came with two hushpuppies, and they were good, even though they were kind of one note, oniony but lacking the spice that I prefer. I then turned my attention to some of the holiest dishes in the Southern culinary canon—the barbeque and macaroni. I’ll preface this by saying no one makes macaroni better than my mama. I know everyone says this, but my mama’s macaroni is so good that I rarely eat macaroni. I don’t have a taste for anything but hers. So take it as a serious compliment when I tell you that this macaroni was good. It was so good that I really didn’t take no notes on it. The only thing I wrote down was “banging,” which is really all you need to know. My mama was kind enough to let me have half of one of her ribs, and I was promptly mad that I didn’t order them, cause they were amazing. I haven’t had good ribs in a while, but they were everything I remembered good ribs being—tender and juicy, peppery and sweet, and literally finger licking good. It was good enough that I started thinking about when I could come back to get some. Finally, I had the chopped barbeque pork, which had been declared the World’s best, which I had heard defined South Carolina’s barbeque style in general, and let me tell you—it really wasn’t that good. The texture of the meat was sort of grainy, and there was a surprising dryness to it that was unlike almost any other pulled pork I’d ever had. When I added some of the barbeque sauce they’d offered us on the side, it was much better, but I was so shocked by that first bite that it was like suddenly, the whole experience came into focus for me. Honestly, yall, Maurice’s was just not all that. It wasn’t all that scary. It wasn’t all that impressive. The tea wasn’t all that sweet. Somehow, with that bite of dry pork, all the power it held over me as a landmark from my youth sort of faded away, and it was just another barbeque restaurant. Crazy, right? That macaroni was good though. As we left, we did see other black people in the restaurant, and they didn’t seem surprised to see us there, though I was shocked and a little shamed, like my pastor had caught me out without stockings on or something. Maybe we all decided it was okay to go to Maurice’s, and I just missed that meeting while I was at Kenyon. My mama ordered a dipped chocolate cone to go. I took a few pictures for this piece and went back to my car, pulled out of the lot. I’ll probably never go to Maurice’s again, not because I was offended by the experience or because the food was nasty—honestly, if I was desperate for some good ribs and decided to lay my politics down forever, you might catch me over there again. I’ve put aside many a political objection for a good Southern meal (I’m looking at you, Chick-fil-A). But the fact is this—Maurice’s was trying to sell a particular revisionist image of itself that I just couldn’t swallow. Their website says that “this new generation [of Bessingers] has one simple focus—to serve the best pit-cooked BBQ in South Carolina, just like Joe did back in 1939.” And the fact of the matter is, the way Joe (the original Maurice’s father) and Maurice himself made barbeque can’t make up for me the fact that this restaurant still wants to honor a man who was a blatant white supremacist. I’ll just have to get my barbeque somewhere else--and luckily, there’s lots of good options right here, in our state.